Good tip, I've always wanted to try this out! I think the corsage idea is nice, but I'm not sure if I'm picturing it quite correctly in my mind. Could you provide pictures of ways you could wear the corsage on your hijab as well? I emailed them over a month ago to ask them if they had the item I requested in stock and if they could ship it out immediately after I had placed the order. They sent me an email confirming they were able to do that. I placed the order and a month onwards and I still hadn't receive the item. I then emailed them to complain about thier poor service, they didn't even bother apologising in the response. When I did finally receive the order today morning, they sent the wrong item. Just to warn readers, don't bother ordering from such a company. It isn't worth the risk. 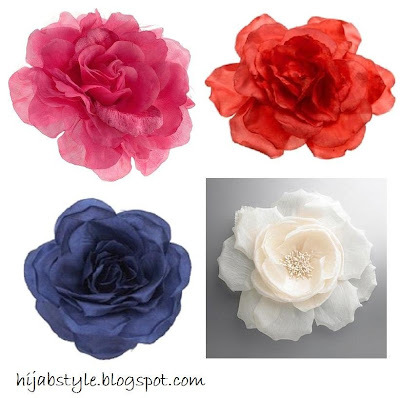 salaams sis i got corsages but only have worn them on jackets wud u show us how u wud wear them on hijaabs? By the way I love your blog, really inspirational and insightful, so Jazak'Allah Khair for your hard work!! My name is Thuma n im a muslim girl from Maldives. i jus discovered ur blog yesterday n em still browsin it. Its really kewl . . i cant wait to put tgther sme of th outfits uv out up here :) keep them comin! I love this idea, I usually wear corsages on the front of my hijab where you would wear a brooch (near the shoulder), alhtough I have been asked if I am going to a wedding! do you have tutorial to use corsages on our hijab? thanks anyway.